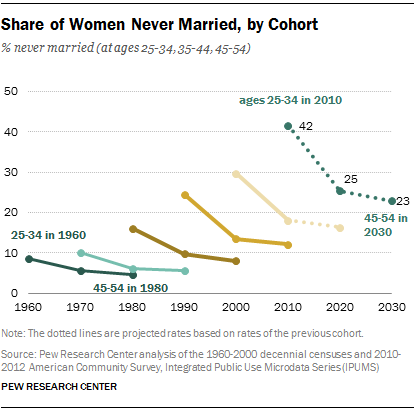 The share of never-married Americans has risen dramatically in the past five decades. Today, one-in-five Americans ages 25 and older have never been married, compared with just 9% in 1960. Men are more likely than women to have never been married. In 2012, 23% of men and 17% of women ages 25 and older had never been married, and the gender gap has grown since 1960. As this gender difference indicates, women are more likely than men to have ever been married. Among adults ages 25 and older, women are slightly less likely than men to be currently married (54% vs. 60%). However, women are much more likely than men to be currently divorced, separated or widowed (29% vs. 17%). Today’s young adults are slow to marry by historical standards. As of 2012, at age 25, 78% of men and 67% of women had never married. About five decades ago, only 28% of men and 13% of women had not married by age 25. The median age at first marriage is 29 for men and 27 for women today, up from 23 and 20, respectively, five decades ago. 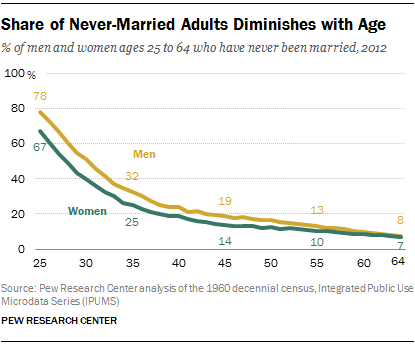 The share of never-married adults declines with age. 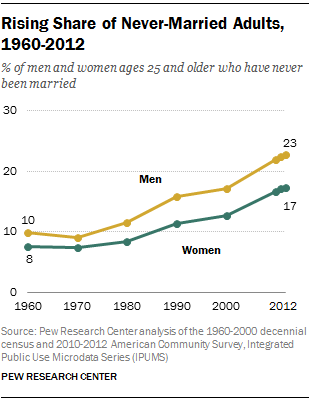 In 2012, 32% of men and 25% of women had never been married by age 35. And by age 45, 19% of men and 14% of women had never married. The corresponding shares in 1960 were much lower. At age 45, only 7% of men and 6% of women had never married. Most never-married Americans will eventually marry, given that very small shares of adults were still single at age 64 in 1960 (8%) and 2012 (7%). However, 2012’s 64-year-olds were born in the late 1940s, and it is hard to say whether young adults today will follow in their footsteps when they reach older ages. Looking at data on successive cohorts of young adults reveals a clear historical pattern: Since 1970, each new cohort of young adults had a higher share of never-married adults than the cohort that came before it. The Pew Research analysis suggests that when today’s young adults reach their mid-40s to mid-50s, a record high share (roughly 25%) is likely to have never been married. In 1960, 16% of men ages 25 to 34 had never been married. After 10 years, when this group was 35 to 44 years old, only 8% had never been married. By 1980, when this cohort was ages 45 to 54, 6% had never been married. The next cohort starting in 1970 followed a similar trajectory; by 1990, when these men were ages 45 to 54, 6% had never been married. 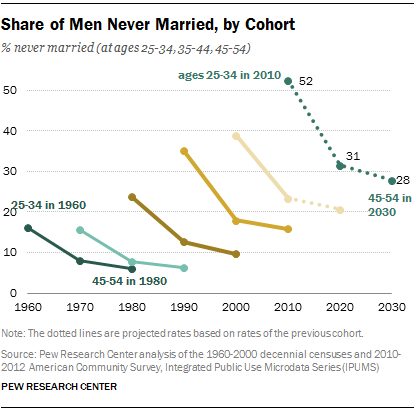 Compared with the previous two cohorts, a much higher share of young men ages 25 to 34 in 1980 was never married (24%). After 10 years, the rate dropped to 13%, and by 2000 it was 10%. From 1980 forward, each successive cohort of young men had a higher share that had never been married: 35% of young men in 1990 were never married, compared with 39% in 2000 and 52% in 2010. And by the time each cohort reached the ages of 45 to 54, a higher share had never been married than in the earlier cohorts. The trajectory of each cohort of young women mirrors that of young men. However, at each stage, women are less likely to have never been married. About 42% of young women ages 25 to 34 in 2010 had never been married, compared with 52% of young men. The data suggest that when this cohort reaches ages 45 to 54, 23% will still have never been married, if they follow the rate of previous cohorts. The likelihood that a never-married adult will get married after age 54 is relatively small. 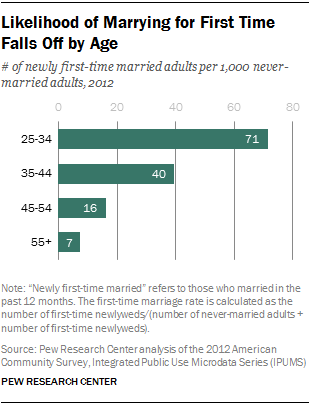 In 2012, 71 out of 1,000 never-married adults ages 25 to 34 got married. The rate dropped to 40 per 1,000 among never-married adults ages 35 to 44, 16 per 1,000 among never-married adults ages 45 to 54, and only 7 per 1,000 among never-married adults ages 55 and older.